We had to choose a Vietnamese dish to serve alongside our pho bo. [link] I started flipping through our Vietnamese Food & Cooking book. We had several humongo salmon steaks in the fridge, so I had to choose a seafood dish. There were a couple of other contenders -- Fish in Coconut Custard and Fish Steamed in Coconut Milk with Ginger, Cashews and Basil -- but for ease and speed, I settled on making Spicy Pan-Seared Tuna with Cucumber, Garlic and Ginger. Well, pan-seared salmon, not tuna. 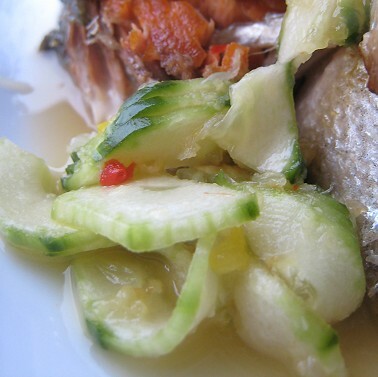 This recipe simply called for cooking the fish and spooning over a sweet, tangy sauce with cucumbers. 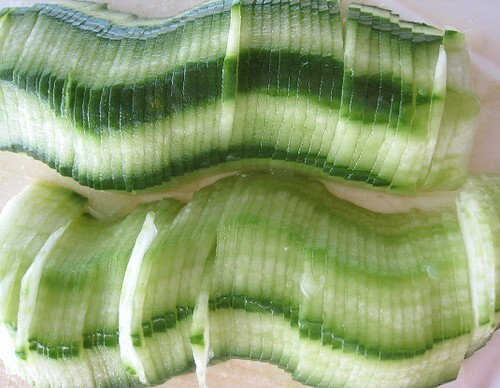 To make it easier for myself, I sliced the cucumber into half-moons, but the recipe calls for long strips. This was a nice "light" companion dish to our pho bo. Very clean and refreshing, yet punchy in flavor. The ingredients and quantities are from the book. I've paraphrased the method/procedure. Grind the ginger, garlic and chillies to a pulp with the sugar using a mortar & pestle. Stir in the nuoc mam, lime juice and water. Mix well. Leave dressing to stand for 15 minutes. Cut the cucumbers in hlaf lengthwise and remove the seeds. Cut the flesh into long thin strips. Toss cucumber in the dressing and leave to soak for 15 minutes. Wipe a heavy pan with the sesame oil and rub the garlic cloves onto the surface. Heat the pan. Add tuna steaks and sear for a few minutes on each side. (Rare to medium-rare.) Place onto a warm serving dish. Use tongs or chopsticks and lift cucumbers pieces from dressing. Arrange around the tuna steaks. Drizzle dressing over the dish and serve immediately. Thanks for the book recommendation! I've been looking for an authentic Vietnamese book to round out my library. hmnnnn.. this looks delish and healthy. 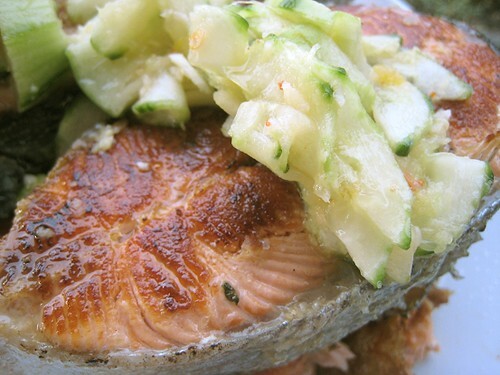 just did salmon myself... your cucumber pics are nice. I like the Thai dressing, it's similar to the one i toss roasted brussel sprouts with. It's yum! Yumm looks good. I love how clean and balanced Vietnamese flavours are. This is a terrific meal, I love all the flavors you used. 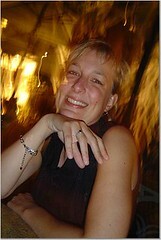 The photos are really great too. what can i say but everywhere i put my eyes my stomach is rumbling! !hehehe yuuuuuuuummmy!! 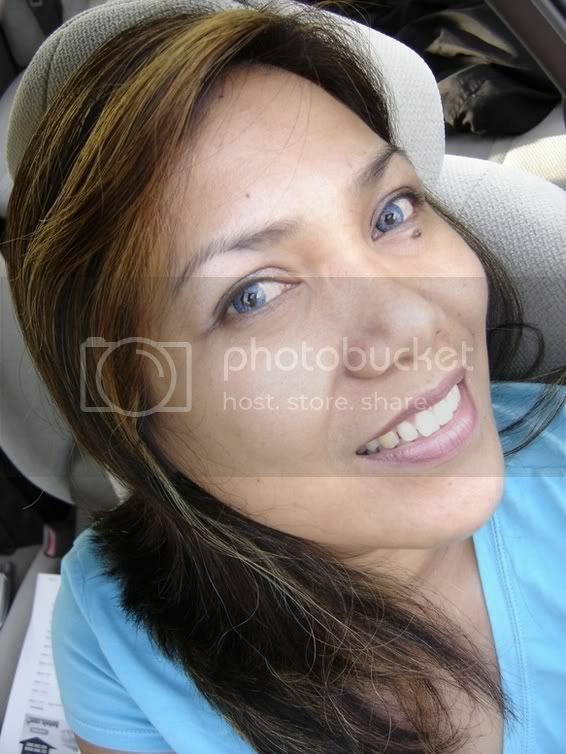 You should also get that one by Mai Pham: _Pleaseures of the Vietnamese Tbale_. Thanks! It was rare that the cucumberslices didn't fall out of their cucumber formation! Teehee. That's a good sign for us. This one looks really good as well. 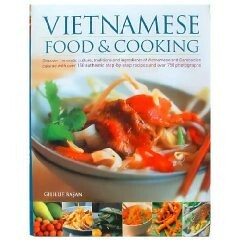 I have been wanting to pick up a book about Vietnamese cooking for a while. I don't know how readily available this book is, but the one in the pho post (Pleaseures of the Vietnamese Table) should be easier to find, I think. Thanks! It was a rare occasion that they were all pretty even lik that, so I had to take pictures, haha. what an incredible job on cutting the cucumbers! 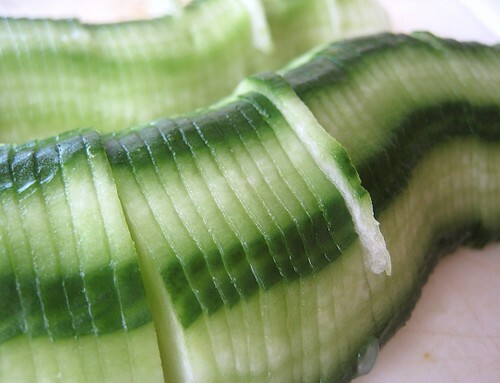 Wow, beautiful knife skills, those cucumbers look great!